The design brief was simple. 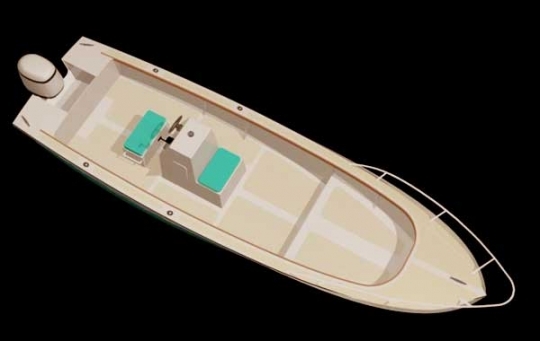 Boat definition: A low powered, narrow and long offshore boat 28' by 8' 6". Designed for moderate planing speeds, 20 kn cruise, 25 kn WOT. Hull dry weight 2,000 lbs max., less preferred. Displacement fully loaded 5,000 lbs. Primary propulsion: single or twin outboards. Fuel capacity 80 gallons minimum. Optional: stern-drive gas or diesel. There is another version of this hull named GS28X: GulfStream 28 with eXtras. 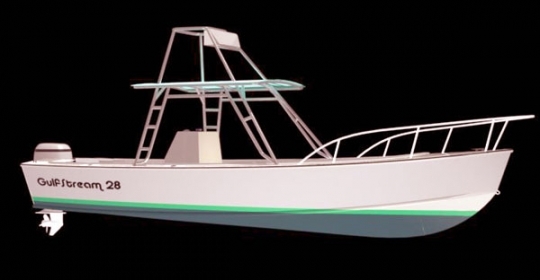 The GS28X plans show in addition to the standard features, variations on hull shape (flare etc.) different motorizations, more layout options and specifications for foam sandwich construction.